Wondering what to do with a huge harvest of sand pears? I have really enjoyed working my way through my laundry basket of pears. My most recent project has been these preserves. Sand pear, juicy pineapple, and tart lemon combine in a spread that is delicious and makes good use of a windfall of sand pears. When I first started looking for sand pear recipes, I found a recipe on Oysters and Pearls that sounded intriguing. It called for the addition of pineapple and lemon. It is an old recipe, using paraffin wax for sealing(no longer recommended! ), but the flavor combination inspired me to create a preserve with those flavors. Ingredients: 8 cups peeled diced sand pears, 22 oz can crushed pineapple in juice, 3 cups sugar, finely chopped flesh of one lemon, approx 3 tablespoons of bottled lemon juice for canning. 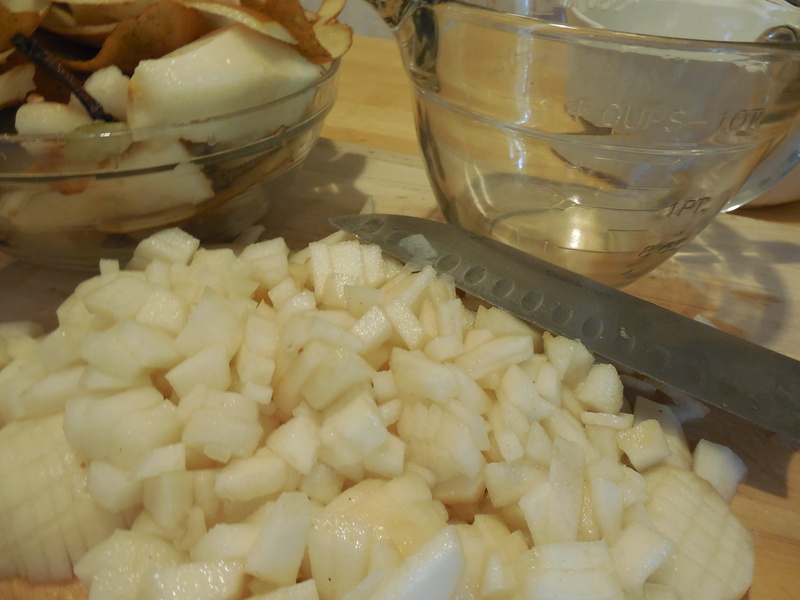 Combine all ingredients except bottled lemon juice in large stockpot, and simmer until it passes the gel test. For more information on how to test for gelling, click here. I ended up with approximately 5 half pints of preserves. Canning guidelines for sand pears call for the addition of 1 tablespoon of bottled lemon juice per pint. I like to round up for safety! Process in boiling water canner for 10 minutes. Enjoy! If you are fortunate enough to have access to sand pears, I highly recommend this recipe. The grittiness of the pears is not the focus, and the pineapple adds a nice accent flavor. 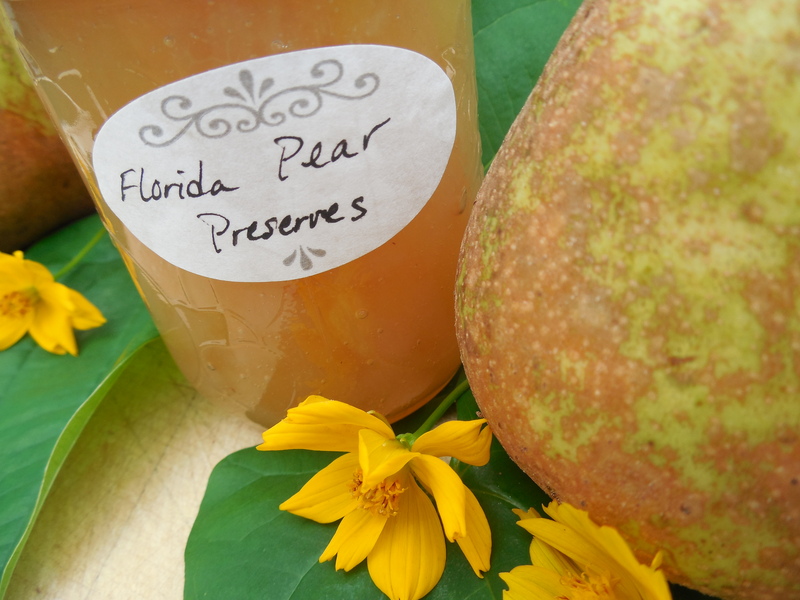 So far I’ve made Spiced Pear Butter and these Florida Pear Preserves. 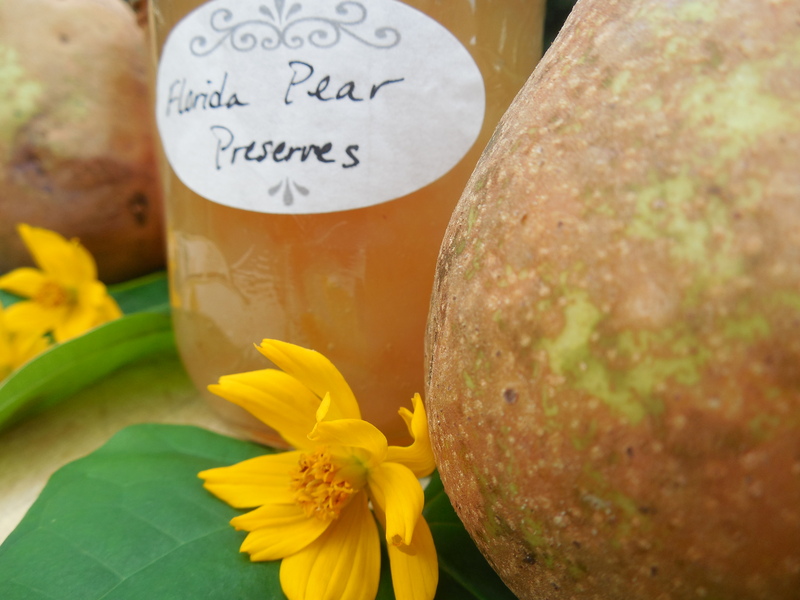 Next post on the sand pears will be… Nana Clement’s Pear Conserve! I have been entrusted me with a family recipe that I am so eager to try. It has walnuts in it, which means that I may just eat it out of the jar with a spoon, or pour it over ice cream. How do you like to eat a yummy conserve? Look for that sand pear recipe soon! I am definitely going to have to try this! Sounds yummy. I’m thrilled that you found inspiration in my blog and family’s recipes! This sounds delicious. I am bookmarking so I can come back and try your version. Thanks for linking back and sharing the sand pear love! Adding the pineapple was a brilliant idea. The two go so well together and I am so glad you shared your family’s recipe!